The Honda CR-V is an appealing option if you’re in the market for a stylish and spacious family SUV that doesn’t skimp on cutting-edge technology. If you’ve already decided that you want the CR-V but just haven’t figured out which of the four trims best suits your needs, this breakdown across the lineup should help you narrow it down. The Honda CR-V is well-equipped from its base, outfitted with high-end features like heated front seats, dual-zone automatic climate control, proximity key entry system with push-button start, and a 7-inch Display Audio System touchscreen with HondaLink™ and Apple CarPlay™ and Android Auto™ compatibility. 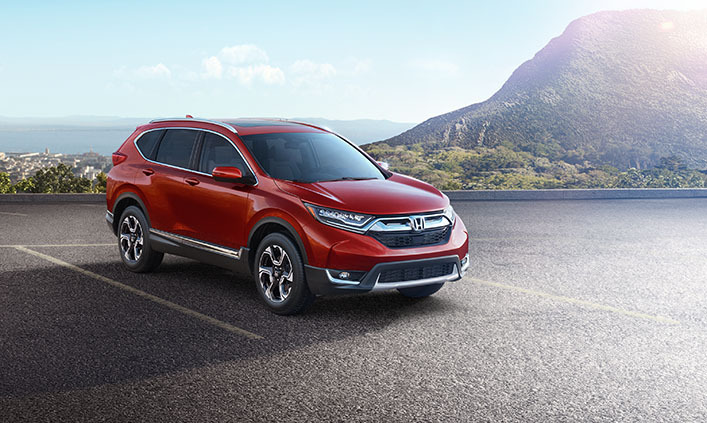 If you opt for the CR-V LX with Real Time AWD™ and Intelligent Control System™, you’ll also benefit from Honda Sensing™ Technologies like Collision Mitigation Braking System™ (CMBS®), Lane Departure Warning (LDW), and Adaptive Cruise Control (ACC) with Low Speed Follow (LSF). The CR-V EX ups the ante in terms of lavishness thanks to a 12-way power-adjustable driver’s seat with power lumbar support, one-touch power moonroof with tilt feature, and a woodgrain instrument panel trim finish. It also upgrades the aural experience with a six-speaker, 180-watt AM/FM audio system and inspires confidence with a Honda LaneWatch™ blind spot display. There’s even more luxury with the CR-V EX-L, which adds perforated leather-trimmed seating, heated rear outboard seats, a heated and leather-wrapped steering wheel, and driver’s seat memory. Loading cargo into the rear becomes even easier with a power tailgate with programmable height functionality, making this trim a great choice for grocery runs. At the top of the range is the Honda CR-V Touring, which adds Honda Satellite-Linked Navigation System™ and bilingual Voice Recognition to make getting to your destination even easier. A nine-speaker, 331-watt AM/FM Premium audio system with a subwoofer provides exceptional sound. The interior luxury is amplified with a panoramic moonroof and ambient lighting on the front door handles. Its exterior presence is boosted with auto on/off LED headlights, dual exhaust with a chrome finisher, and roof rails. The best way to experience the 2018 Motor Trend SUV of the Year® is in person. * Stop at St. Albert Honda and check out our selection of Honda CR-Vs to figure out which version is best for you. *The 2018 CR-V has been named Motor Trend’s SUV of the Year® thanks to impressive cargo space, efficient fuel economy, Honda Sensing® safety and driver-assistive technology that is standard on EX and higher models.